Below are some examples of existing mini-pop (hub home) sites in Golden. The equipment on future mini-pops will be determined by network requirements as well as homeowner preferences. If you are interested in being a mini-pop site for Au Wireless, please contact us. We are continually looking at new homes. Typically, homes that are situated higher on the hill side or have taller roofs than those around it make for good candidates. We are happy to visit with you and perform a site assessment and discuss options. The benefits of being a mini-pop include free high-speed Internet for the lifetime of the mini-pop on your house! This is a mini-pop on the west side of town. 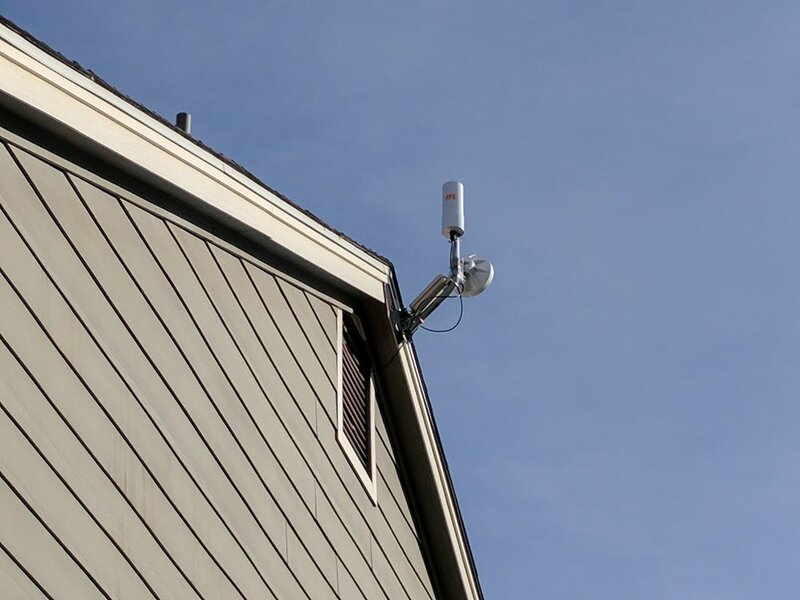 Mount is on the upper gable of the roof and has both an incoming high-speed link as well as the antenna to relay to neighbors and a small switch box - all attached to the mounting arm. Power usage for this set-up is 25 watts. Home is receiving 200 Mbps Internet. This is a mini-pop on the far east side of town. This install attached a short pipe to an existing solar mount. This has a flat panel antenna for the inbound dedicated service and then the round omni antenna at the top servicing the neighborhood. Power usage here is 10 watts. Home is receiving 100 Mbps Internet. Here is a mini-pop on the north end of town. This house has a flat roof where we were able to place a flat roof mount. It is held in place with a rubber mat and a couple cinder blocks - no attachments to the roof. Here, we went with 2 antennas to relay (the top two) as well as the inbound connection (bottom left antenna). In addition, there is a switch that powers all this on the roof. Power usage here is 15 watts. Home is receiving 250 Mbps Internet. Another flat roof install with a non-permanent mount in the center of the roof. This install is nearly invisible from the ground. This is an omni antenna servicing 360 degrees. Power usage here is 15 watts. Home is receiving 200 Mbps Internet. A peaked gable roof install on the west side of town. Lower antenna is bringing in dedicated Internet from our main fiber connection. Install has an omni antenna and a switch mounted to the J-arm which is bolted to the side of the gable.